NEW YORK (CNNMoney.com) -- Thanks to new law effective last month, colleges and universities are now required to list all course materials online before the start of the semester. Used books have always been cheaper than new ones, but renting is for the super-saver. 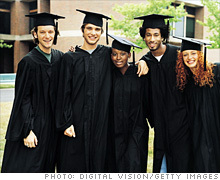 Compare rental prices on sites like Chegg.com and CampusBookRentals.com. Both of these sites provide free shipping on rental returns. But keep in mind, this is a little like online movie renting. You will be hit with a hefty fee if you return the book just one day late. And the campus library doesn't charge a dime! Plenty of colleges set aside copies of textbooks in the library that can be used at no cost at all. If you are willing to forego your hi-lighter for a semester, purchasing textbooks in an electronic format can be a bargain. Check out sites like CourseSmart.com and AbeBooks.com. These sites allow you to download textbooks to your computer or handheld device for less than you will pay for the hard copy and the e-text is often accompanied by supplemental course materials, like practice questions. Think you won't use the whole book? iChapters.com allows you to buy and print textbooks one chapter at a time. If you want to go the old fashioned route and buy your books, shop around. Head to CampusBooks.com or BigWords.com to compare textbook prices from vendors like Amazon.com, Barnes and Noble, and Half.com. These site will even add up the total price of an order so you can compare the cost of multiple books plus shipping.